Tiled floors look good, don’t they? But cleaning dirty tiles often becomes a tiresome job. It’s no secret that most cleaning tasks scare the bravest of us all, but keeping your prized tiling clean is not that hard. Tiling has taken a prominent place in contemporary homes, owing to its elegant appearance and easy maintenance. It’s not used just for flooring. Tiled walls, countertops and even roofs are very popular. 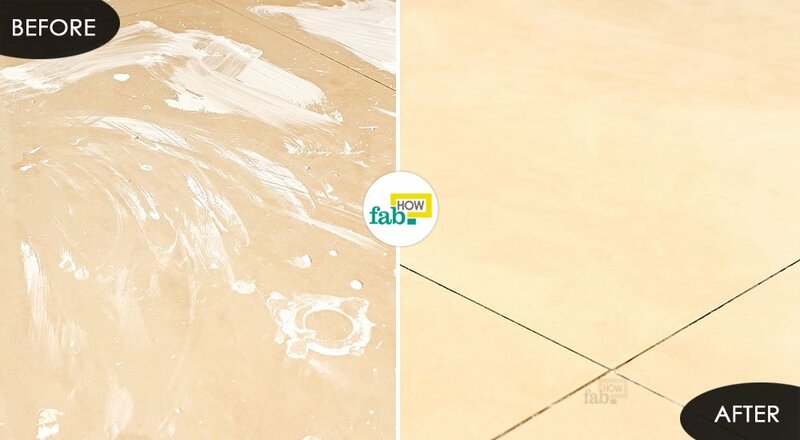 While cleaning tiles is easy enough, sometimes you end up dealing with an astounding mess and stubborn stains. Tile grouts often become the most difficult to clean. Fortunately, heavy duty chemical cleaners are not the only solution. You can easily clean tiles with some readily available household items and make your housekeeping practices more efficient and easy on expenses. 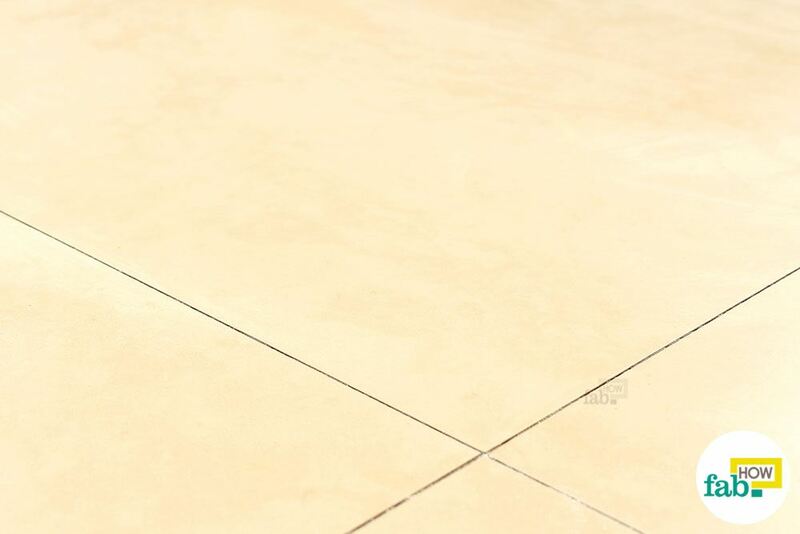 If you need to clean loose dirt and grime from your tiles, using a vacuum cleaner is your best bet. It is a fast, efficient and surefire method to lift up any kind of loose debris, whether it is spilled food crumbs, dust or pet hair. You may need to adjust your vacuum cleaner to the bare-floor setting to protect the tiles. The brushes and beaters in a vacuum that efficiently clean dirt and dust from deep within carpets can damage the appearance of the tiles. If you need to clean a small area, you can use a hose attachment. This will also help you clean the dirt from the edges and corners. 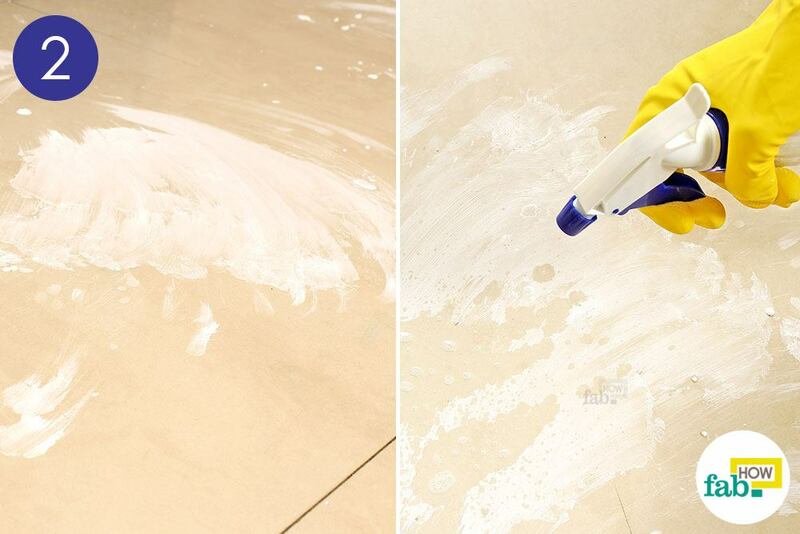 If you have wet mud or liquid spills on your tiles, you should mop the floor. A damp mop can easily pick up a variety of liquids or sticky grime like spilled juices, syrups, sauces, oil, wet paint and even your pet’s urine. Wet the mop with warm water. Squeeze out the excess water to leave the mop only slightly damp. 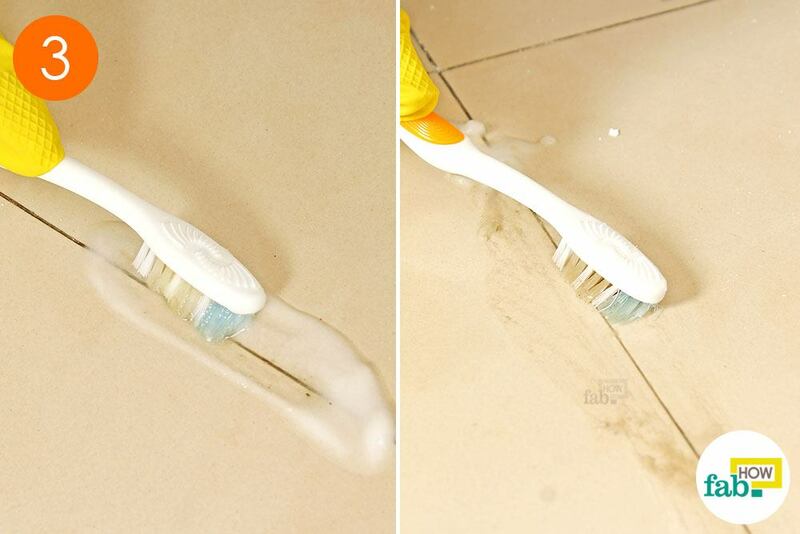 Wipe the tiled floor with the damp mop. 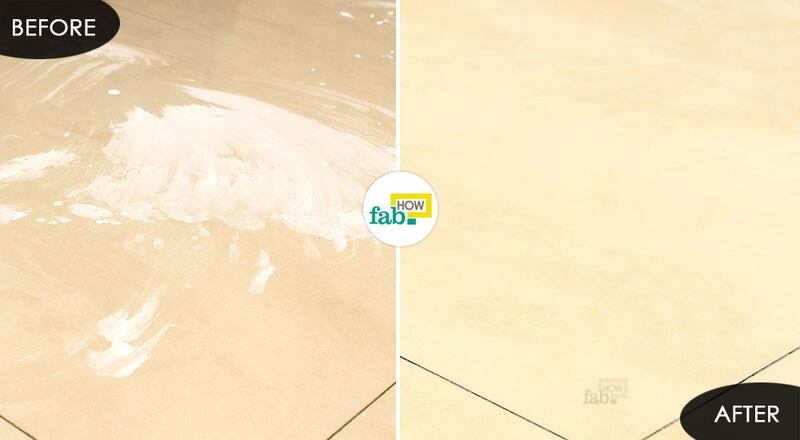 If the stains are stubborn, let the damp mop remain on the soiled tile for about 5 minutes, then wipe the tile clean. Similarly, you can leave a soaked rag over the stubborn grime. 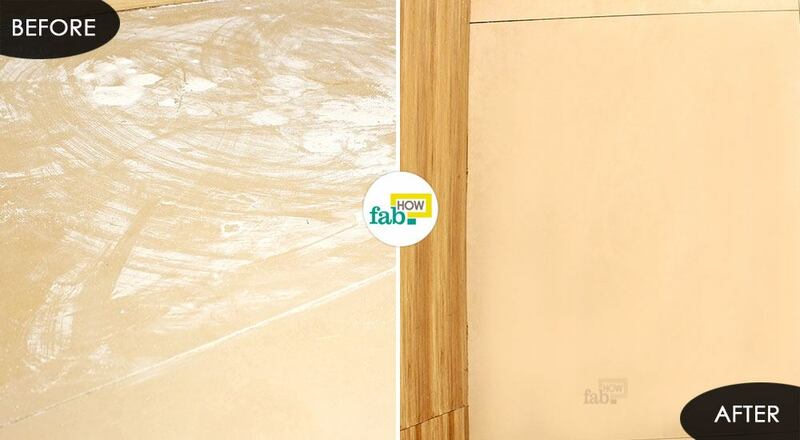 This allows the water to loosen up the grime and makes it easier to clean the tile a few minutes later. 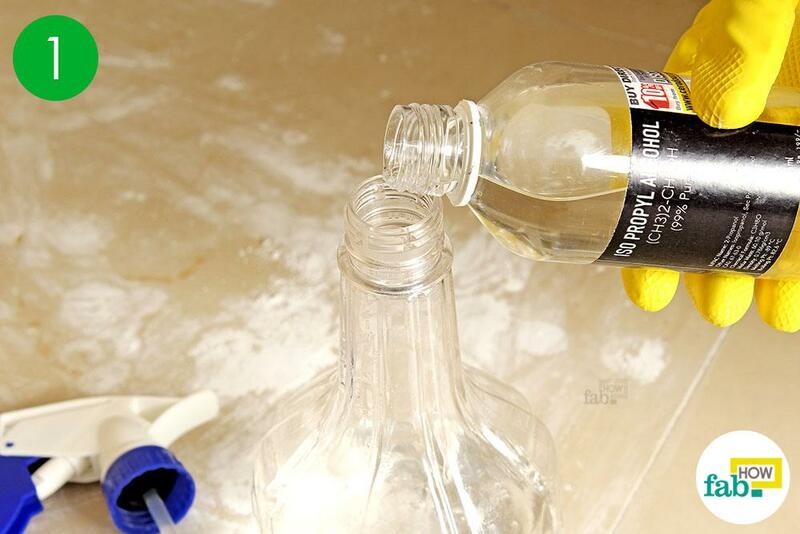 Pour some warm water into a spray bottle. Add an equal amount of white vinegar to it through a funnel. 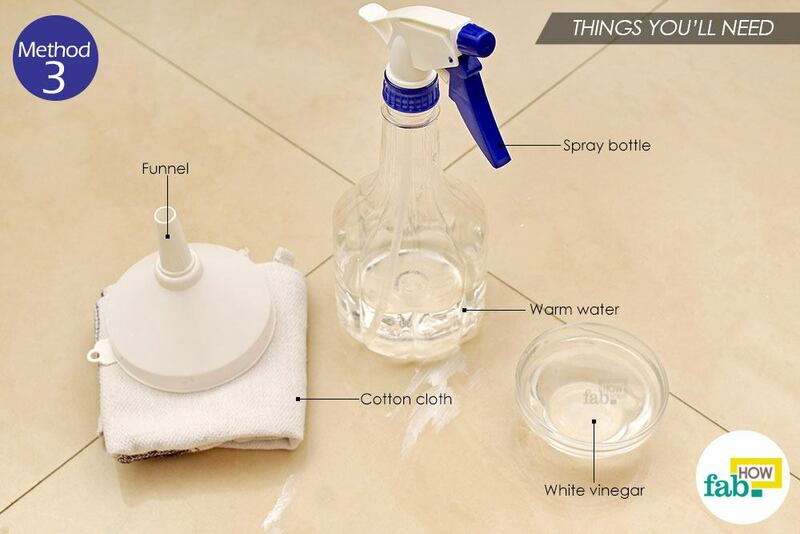 White vinegar is a natural cleaner and a safe alternative to commercial products for everyday cleaning. It effectively removes stains and eliminates offensive odors. 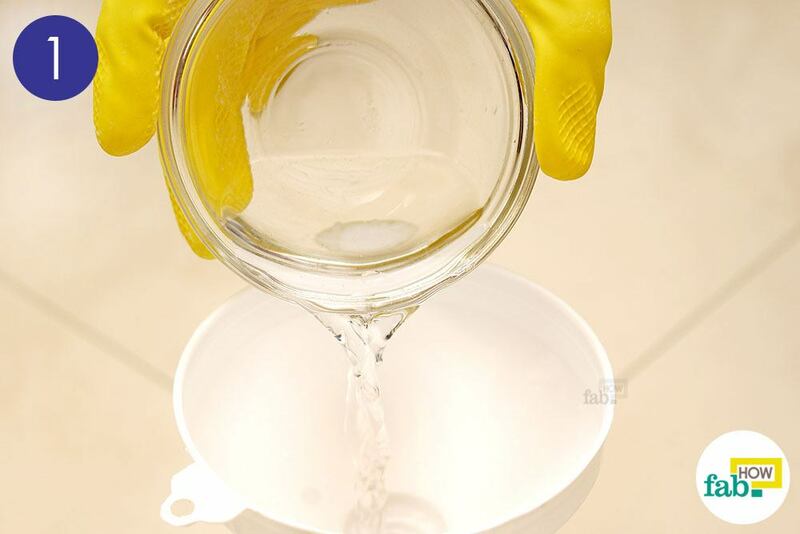 If you’re bothered by the smell of white vinegar itself, then quit worrying as the vinegar smell dissipates after some time. 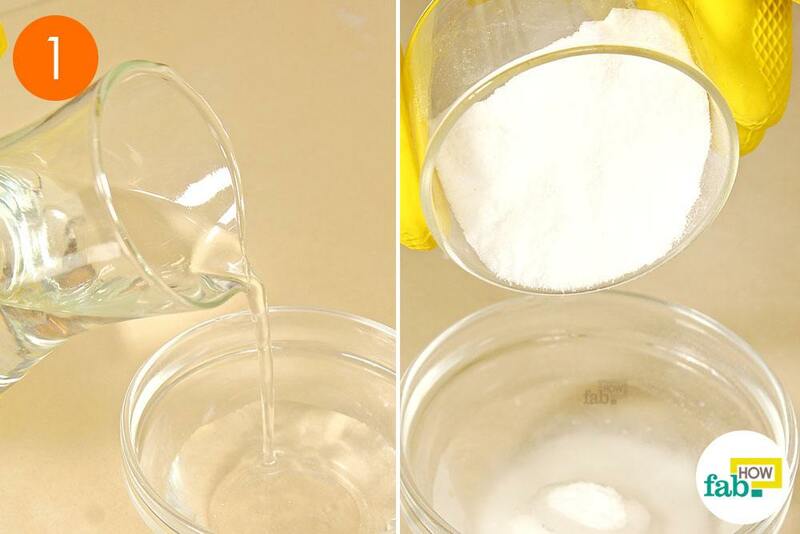 White vinegar is very good for spot cleaning and stain removal. Spray the diluted white vinegar over the dirty patch on the tiles. If the grime is old, you may let it sit for about 5 minutes. 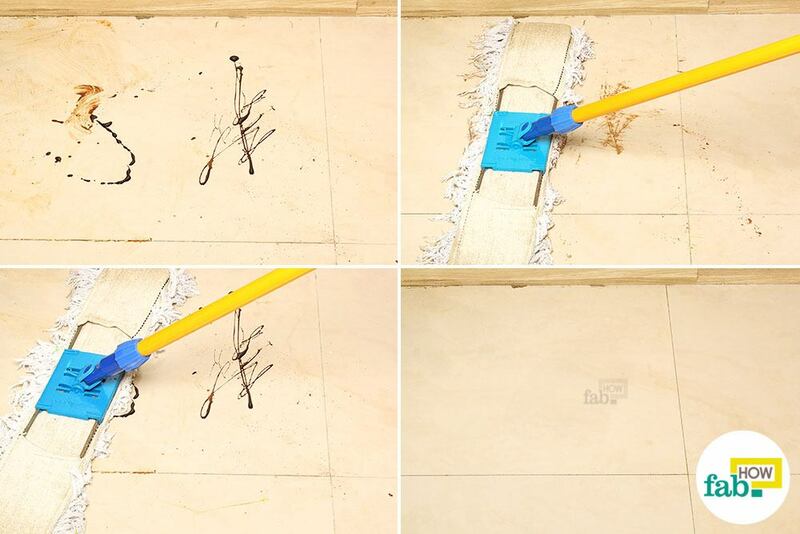 Clear the mess and wipe the tiles clean using a cotton cloth. You can use any discarded cotton rag for this purpose. Put a little water in a small bowl. Add baking soda and make a paste. Baking soda is a tough stain remover. 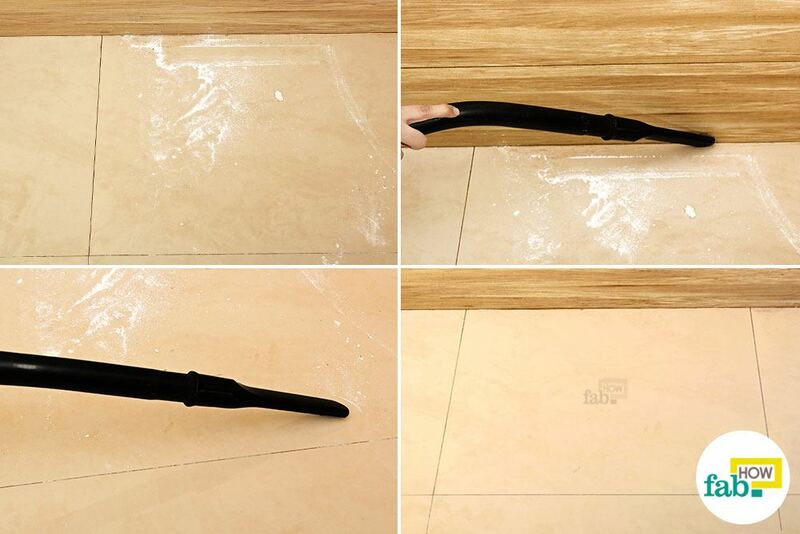 You can also use it to clean the tile grouts. Smear the baking soda paste on the stains. 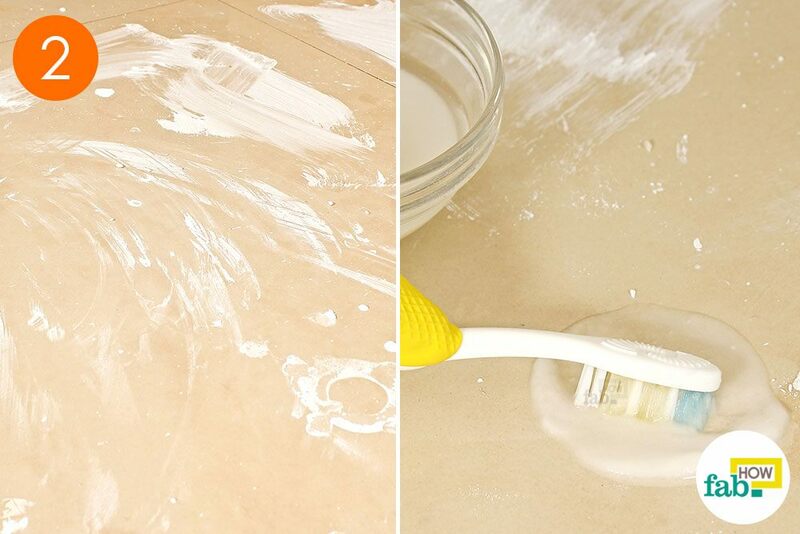 For stubborn stains, leave the paste in place for about 5 minutes. 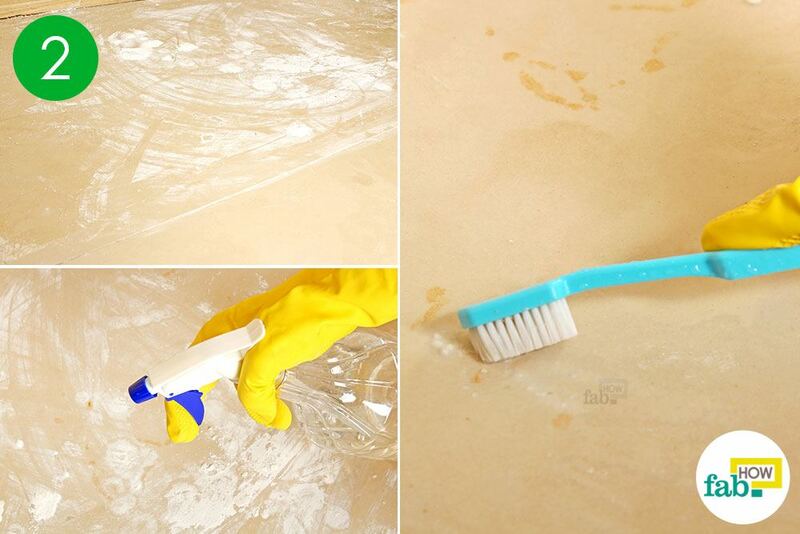 Scrub the baking soda paste over the dirty tiles using an old toothbrush. A toothbrush can help you scrub small areas of tiles without leaving any scratches or dullness behind. Fill the dirty tile grouts with baking soda paste. 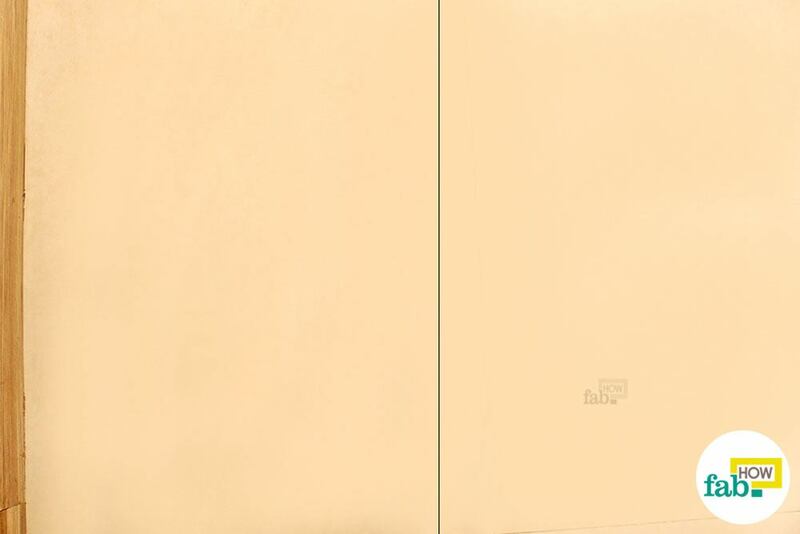 Tile grouts are almost always dirty, so consider leaving the baking soda in place for a few minutes. Scrub the grouts using a toothbrush to dislodge the old dirt and grime. 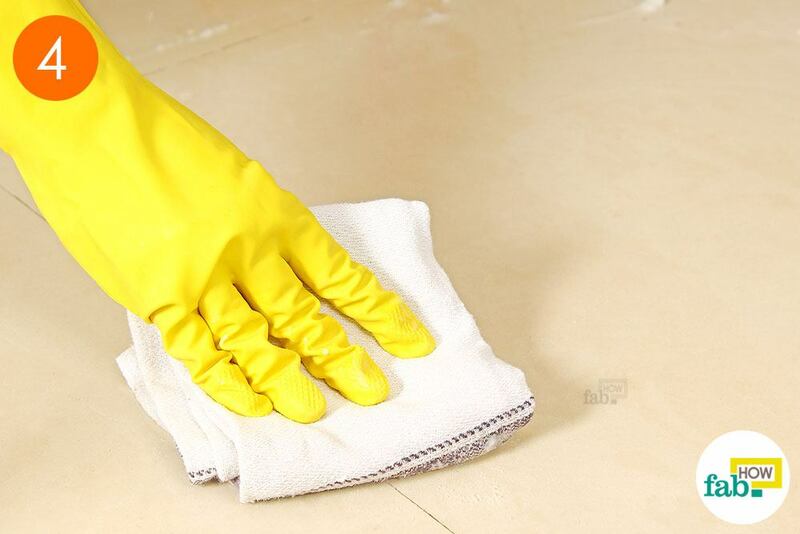 Once you’re done spot cleaning, use a cotton cloth to wipe away the dirty baking soda from the tiles. Pour some water into a spray bottle. Pour in an equal amount of rubbing alcohol. Close the spray bottle and give it a shake to mix the liquids. 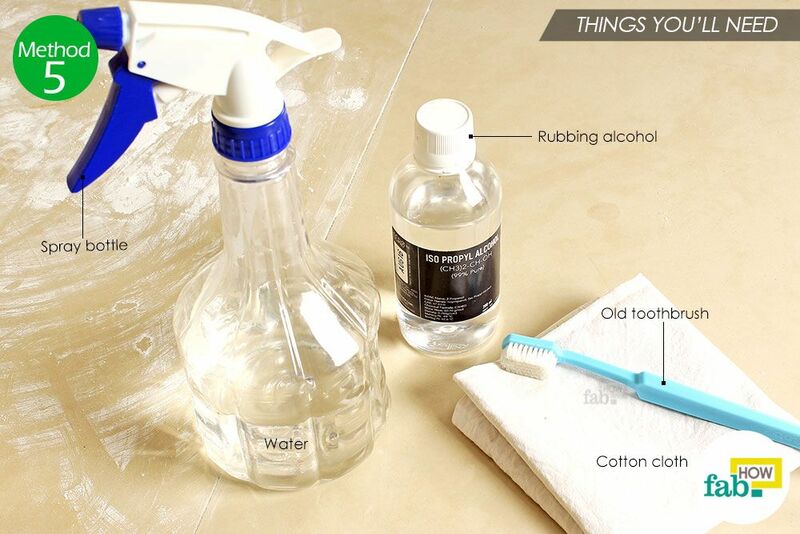 Rubbing alcohol is very potent when it comes to stain removal. It can cut through any type of grime. You can use it to lift off old stains, especially solvent-based paints and ink stains. While effective, it needs to be diluted before use. 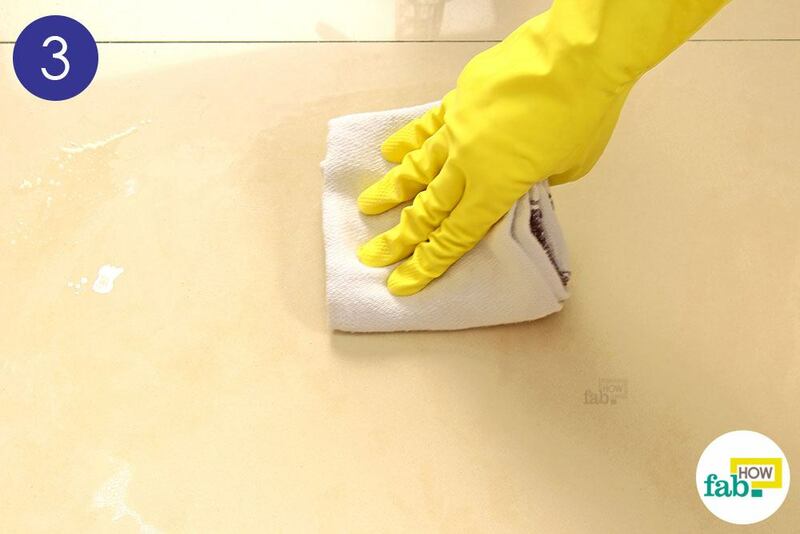 You should use rubbing alcohol on your tiles as a last resort, as frequent use may rob your tiles of their luster. Spray the diluted rubbing alcohol on the stained tiles. Gently scrub the area with an old toothbrush to dislodge the stains and grime. After you’re done, wipe the area clean with a cotton cloth. You don’t need to worry about any residual rubbing alcohol, as it will evaporate on its own. If you need to be more thorough with your vacuuming and don’t want to leave out any corners, use a broom for a thorough sweeping and getting dirt out of the corners first. Vacuum all the dislodged dirt for a good finish. 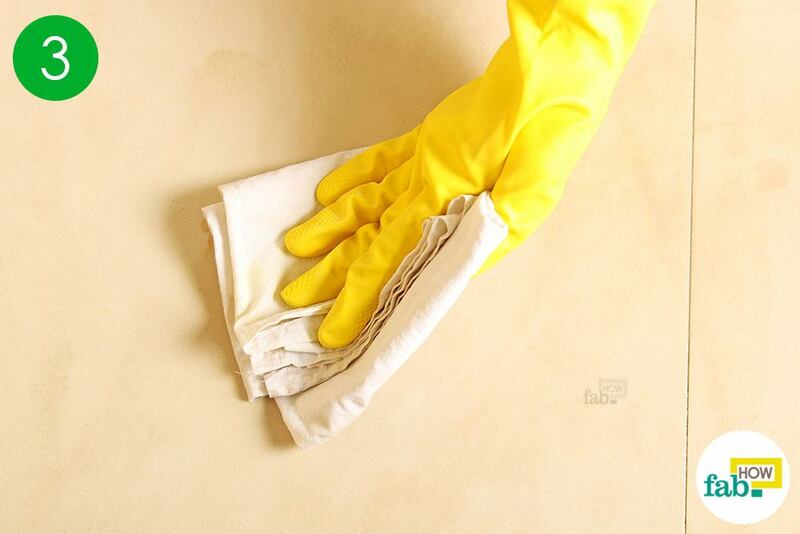 Clean any spills as soon as possible to prevent them from sticking to the floor and staining the tile. 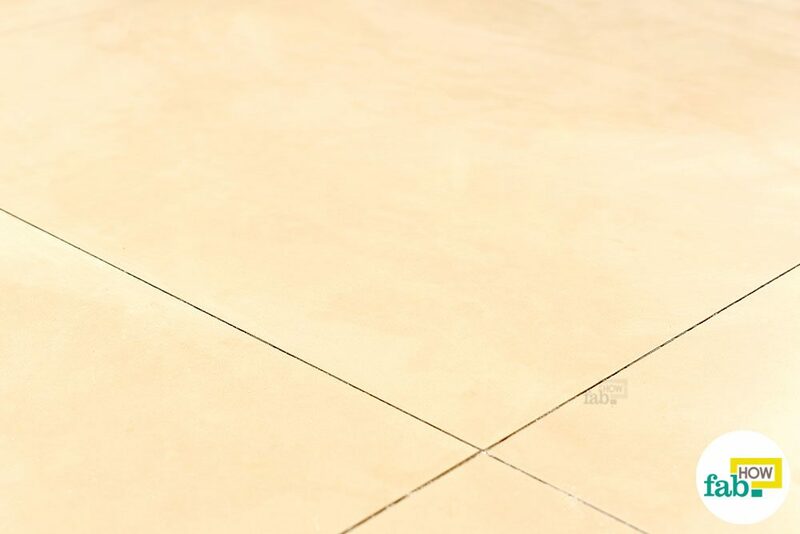 To clean dusty and sticky tiles, start by dry vacuuming. 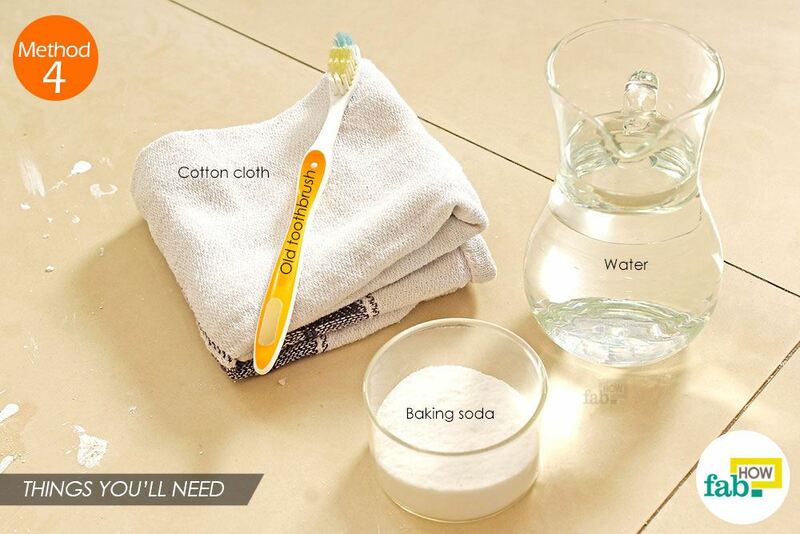 Mop up the sticky residue and do spot cleaning for stubborn stains. You can also add white vinegar to your mopping water for a more effective mopping job.